There are few things more convenient than an efficient, speedy delivery service. Luckily for the inhabitants of the cities of Waco, Belton, and Temple in the state of Texas, Sic’em Delivery offers this kind of high-quality and reliable service at a very affordable price. In order to help potential customers know more about the virtues of this service, the present guide will go over the most important aspects of Sic’em Delivery. Sic’em Delivery began in Waco, Texas in 2013. From the very beginning, the company aimed at providing efficient deliveries of food, groceries, convenience items, dry-cleaning, furniture and most other commercial products. The concept that Sic’em Delivery bases its services on is to function as an intermediary between its customers and various types of commercial entities (such as restaurants and retailers). Without a doubt, one of the most notable characteristics that differentiate Sic’em Delivery from other online delivery services is its versatility. By opening its business model in order to adapt to the needs of diverse companies, Sic’em has managed to create a network of partners that benefit from having their products delivered directly to customers. For one, the company offers its customers the delivery of diverse food items from many restaurants that it’s partnered with. This aspect of Sic’em Delivery’s service allows customers to get their favorite dishes delivered directly to their doorstep quickly and efficiently. Apart from delivering their food items, Sic’em Delivery works with its partners by advertising their business online, providing marketing services and communicating with customers on their behalf. Apart from restaurants, Sic’em Delivery is constantly looking for new partners in retailers and other businesses that could benefit from the company’s services. As a result, Sic’em Delivery currently delivers a great diversity of products and items. Originally, the company offered its services exclusively in the Waco, TX area. However, due to the high quality of its services, Sic’em grew in popularity enough to expand to the Temple, TX and Belton, TX areas. Today, Sicem Delivery is one of the most versatile and reputable online delivery services in the state of Texas. 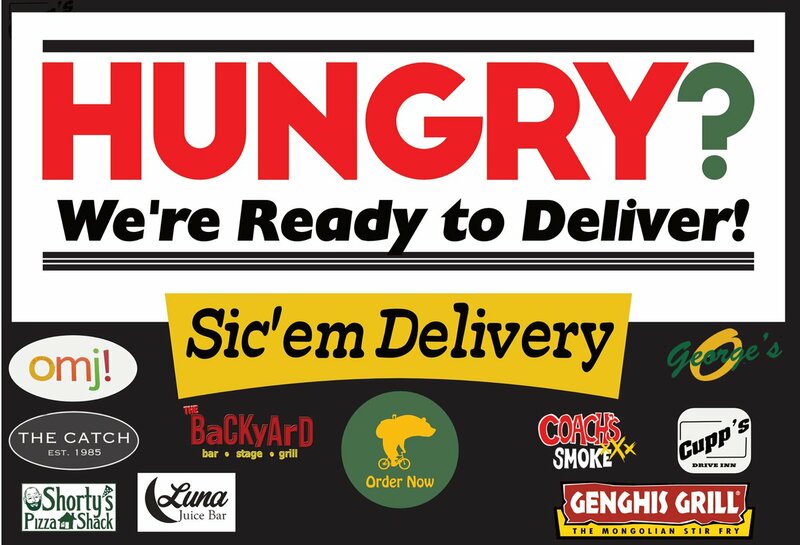 In addition to its main location in Waco, TX, currently, Sic’em Delivery is available as a pilot program in the Temple, TX, and Belton, TX areas. This pilot program has been running for the last year. Recently, in light of the program’s overwhelming success, they decided that both new locations will begin functioning in full-force this year. Apart from setting up shop to begin making deliveries, Sic’em has announced it will be partnering with various new restaurants located in the aforementioned areas. In terms of operational hours, Sic’em Delivery is open seven days a week from 07:00 AM to midnight. Regarding its delivery times, Sic’em is one the fastest on the market. After indicating what they need, customers will receive their order at their doorstep within an hour. As a matter of fact, the average delivery time for a regular delivery is between 30 and 50 minutes. However, potential customers should note that the delivery time may vary according to various factors that include the distance from the restaurant to the home, traffic conditions, the size of the order, weather conditions and the general availability of the requested items. By most accounts, Sicem Delivery has a very reasonable and clear system for charging its customers. By this system, all delivery fees depend on the distance. This is calculated starting when they pick up the order from its business of origin. All delivery fees start at only five dollars. This fee stays the same for the first five miles. They count between the restaurant (or business of other kinds) and the customer’s home. After those five miles, they charge one extra dollar per mile. You should know that the prices charged by Sic’em Delivery are the same as in-store and updated regularly. However, items from non-partnered businesses may cost up to 22% more. Sic’em Delivery offers its customers the opportunity of purchasing gift certificates for any amount between $10 and $500. These gift certificates make great presents for friends, co-workers and family members. They can redeem them at any time in any Sic’em Delivery store. Customers may choose to send their Sic’em Delivery gift certificate via e-mail or print it out. Thus, they can deliver it later. By signing up for Sic’em Delivery’s Loyalty Club, you can enjoy special deals, discounts, and promotions the entire year. This includes six weekly deals that they will have early access to. The Sic’em VIP Loyalty Club can be accessed through SMS text messages or through the Sic’em Delivery App. So, what can we say after going through the most important of its services? We can conclude that Sicem Delivery is a fantastic option. Those who want to receive quality items in a quick and efficient manner will love it! Have you given this company’s services a try before? If so, tell us all about your experience in the comment section below! Hey Buddy!, I found this information for you: "Sicem Delivery 101: Areas, Hours, Fees". Here is the website link: https://all2door.com/sicem-delivery/. Thank you.